This is an awful photo, but this recipe is good. We like it cold, not frozen. I found this recipe in Screen Doors and Sweet Tea. In colander mix cucumber and 1 teaspoon salt. Set in sink to drain for 30 minutes, tossing occasionally. Rinse the cucumbers and set to drain on paper towels. In freezer bag mix - 1/2 teaspoon salt, sugar, sour cream, egg whites, vinegar, lime juice, 1 tablespoon water, parsley, dill, add cucumber and chill in freezer 1 hour. Turn in bowl and beat well, return to freezer bag for 2 hours or until crystallized. Arrange half of apples evenly on the bottom of a greased baking dish. Sprinkle over them half of the brown sugar. Add another layer of apples. Combine rest of sugar, the flour, and butter and spread evenly over top of apples. Press down edges of flour mixture and cut gashes in top to allow steam to escape. Bake in 350 F oven for one hour. Serve warm with whipped cream & chopped nuts. Put an apple in your bag of potatoes to keep them from sprouting. Add lemon juice to an apple recipe if the apples you're using lack tartness or flavor. Eating a raw apple after a meal will cleanse the mouth of 95% of bacteria that cause tooth decay. I read that the best apple pies are the ones that combine 3-4 different types of apples. Something to try. What is your favorite apple? I love McIntosh and Honey Crisp. What do you make when your CSA share includes five onions? Make salsa. The onion is not my friend, but since my husband ate an ENTIRE bowl of this in one night, it must have been good. What kind of stomach do you need to be able to eat this much salsa? I don't have exact measurements, but I chopped one large onion, two large tomatoes, cilantro, and one jalapeno pepper. Another pepper or two could have been added, but the one I used was strong and enough according to the iron stomach. I've also heard of adding a clove of chopped garlic and green pepper. Do you have and other ingredients you add to salsa? Banana split on a stick. I found this recipe in last month's Parenting magazine. 1. Divide strawberry topping among eight 6 oz. plastic or paper cups. Insert a wooden stick into each banana half; place one in each cup, stick side up. Cover and freeze one hour. 2. Divide strawberry ice cream around banana, then pineapple topping, freeze 15 minutes. 3. Spoon vanilla ice cream, fudge topping and chocolate ice cream into cups until full. Place aluminum foil over cup with a slit in the center and freeze overnight. The giveaway ends Monday at 7 p.m. central time. Stop by Two Pink Possums and enter her giveaway for a vintage apron, you have until Tuesday August 5th to enter. Tracey (Paper Dolls for Boys) just opened her Etsy shop full of vintage goodies - please go look at the sewing machine, you will thank me. I know many of you have been suffering with high temperatures for months now, but we are experiencing our first 90 degree days here, so I wanted to share some photos and a recipe to help you feel cool. Mix 1/4 cup of vanilla yogurt, 1/4 cup of cream, pour on top of strawberry layer. You could experiment with this layer as well; use banana yogurt or add a small amount of banana extract. Place 1/4 cup of vanilla yogurt, 1/4 cup of cream. 1/4 cup frozen blueberries with juice. My recipe does not specify how much blueberry juice to use, so I just put some in with the 1/4 cup. Pour into mold. 1. 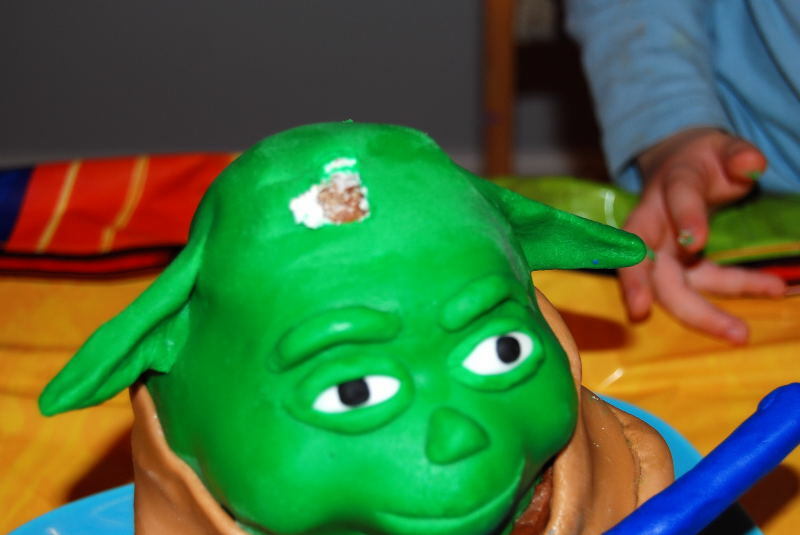 Cake Central has cake decorating tips, tutorials, and pictures of cakes other people have made. You can type in what you want, and see what others have created. I tried to post a link to their site, but for some reason the page won't open - I will try again later. 2. I used my Wilton Winnie the Pooh 3-D pan, they also sell a bear pan that you could use. I cut off the ears (sorry, Pooh, you were so last year). 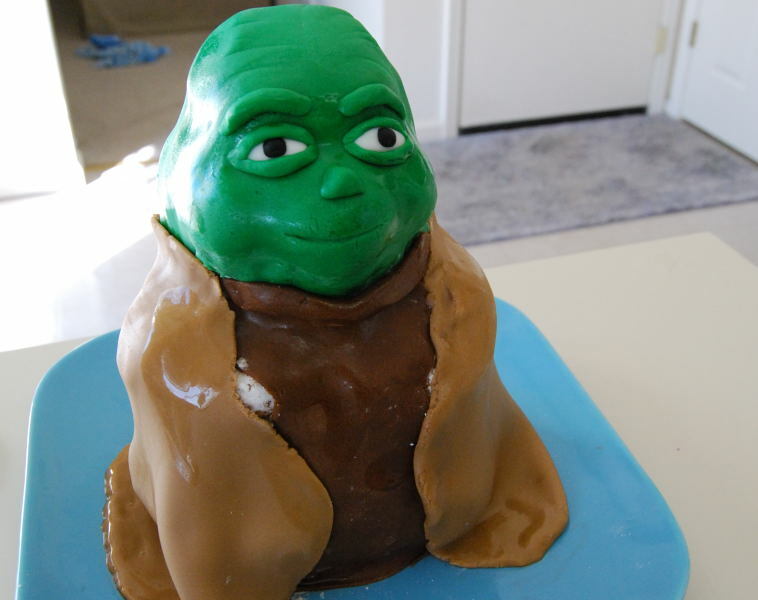 I think the cake would look more Yodaish if the neck was smaller, but I was afraid to cut away that part of the cake and have the head fall off or crack. 3. First I covered the cake with a thin layer of butter cream frosting. I started with the face rolling out Wilton's pre-colored fondant. You can make your own fondant, and you can color it yourself, but I have not had luck doing this - the color always seems uneven. A word about fondant; it tastes bad - there will always be one person who likes it-they are the same ones who can eat five hard sugar flowers off a cake, but most find it gross, so keep that in mind. Fondant is also not cheap - I bought mine at Michaels, so you could use a coupon. 4. Face; roll out a thin layer of fondant into a circle, and gently lay over the head; smooth it out with your fingers. Fondant dries out quickly, so keep any unused amounts covered and use powdered sugar on your work surface and rolling pin to keep it from sticking. I used water to smooth away any cracks or creases, but it seemed to make the fondant shiny (if anyone knows how to do this better, please share). I used a toothpick to make the mouth and wrinkles. I molded the rest of the fondant by hand (cut out circles with a knife for the eyes), and dabbed a little water so it would attach to the face. I saved the ears for last. 5. Body; I rolled our a layer of dark brown fondant for the front, and light brown for his cape. Lay the dark brown "clothing" on first and roll out some into a sausage shape to hide the neck/clothing line. I had to use two pieces for the cape, so there was a seam in the back that I tried to smooth out as much as possible, but you could still see it, but it's the back, so who cares. Then I made the light saber by covering a candy cane with blue fondant. You could also use a rice Krispie treat and mold it with your hands. Use a little water and stick the light saber in place, then make hands and stick them in place. Ross our more light brown fondant and make sleeves for the arms, partially covering the hands. I would put the collar of the coat on next, I didn't do this, but I think it would have made the sleeves look better. 6. Ears; I couldn't get the ears big enough and stay on. They also drooped, but I read that you can mix tylose gum to the fondant to make it more stable. I rolled out more fondant and shaped them by hand; attaching them with a little water and holding them in place for a few minutes. I did not refrigerate the cake; the fondant box said you did not have to, but if you did, condensation could be a problem, so you would have to let the cake come to room temperature before your celebration. The fondant drying out and cracking was a problem for me, but I am not used to working with fondant, so I may have rolled it out too thin or handled it too much. 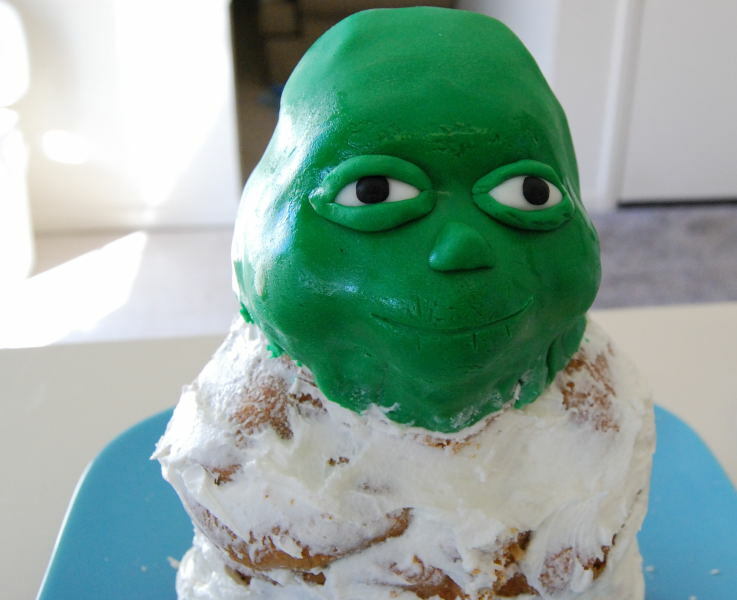 I am sure there are better ways to do make this cake, but this worked for me, and I am not a skilled baker, so anyone can make this. 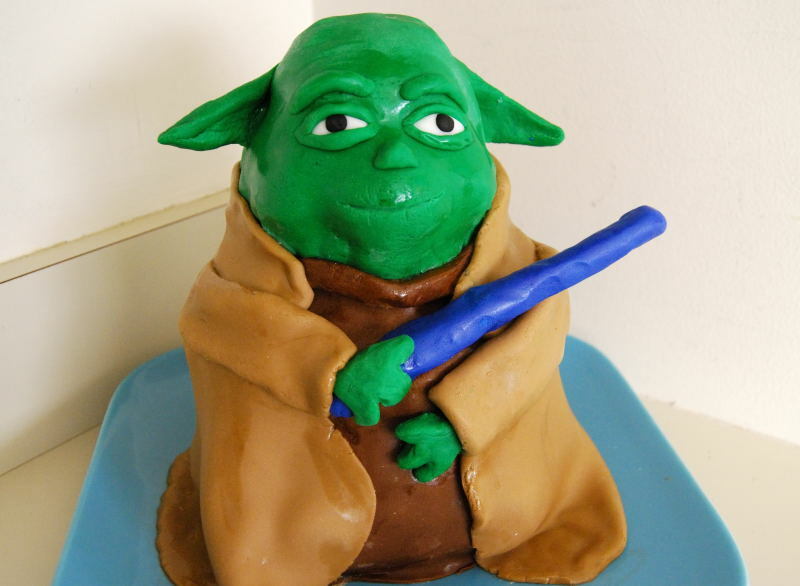 Yoda says, "Cake you must make, young Jedi." Preheat the oven to 400. Wipe the chicken with paper towels and put breast side down in a large roasting pan. Put a little salt, a garlic clove, 3 of the thyme sprigs, and 1 of the bay leaves in the cavity of the chicken. Place the potatoes and remaining garlic around and pour the lemon juice over the top. Rub the skin of the chicken with some of the butter and dot the rest over the potatoes. Bury the remaining thyme springs under the potatoes, then sprinkle salt over the potatoes and chicken. Pour 1 cup of water around the edge of the pan. The recipe did not say what to do with the remaining bay leaves, so I assumed they should be placed in the potatoes near the chicken. Roast for about 1 hour or until the chicken is golden, then turn it over and shuffle the potatoes around. Spoon the pan juices over the top of the chicken and potatoes and sprinkle some salt over the top of the chicken. Roast for about 30 minutes, shuffling the potatoes around halfway through without breaking them apart, or until the chicken is deep golden and crispy and the juices run clear. Transfer the chicken and potatoes to a serving platter and keep warm. Put the roasting pan of cooking juices over medium heat on the stove top. Using a wooden spoon, scrape up all the golden bits form the sides and bottom of the pan. If there isn't enough liquid, add 4 to 6 tablespoons of water. Bring to a boil and cook until slightly thickened. Stir the cream through and let it all bubble up, whisking so it all comes together as one. Pour over the chicken on the platter and serve immediately. If you do not have a roasting pan that can be placed on the stove top, you can scrap the pan juices into a small sauce pot. So far I have liked all the recipes I have tried in this cookbook; most are what I would categorize as comfort food, which appeals to the kids. It's frustrating to spend time making something, only to have the kids look at it an declare it "yucky." Place the milk in a bowl and microwave on high for 2 minutes, or until warm. Sift the flour, salt, and baking powder together in a mixing bowl. Beat the eggs (in a separate bowl), if using an electric mixer-use the whisk attachment, and beat on medium speed for 3 minutes until foamy and pale in color. Turn down the mixer to low and add the warm milk. Gradually add the flour mixture and beat on medium speed for 2 minutes. Let the batter rest for 1 hour at room temperature. Spray a popover tin with nonstick spray and fill the cups almost to the top with the batter and place the tin on a cookie sheet and bake for 15 minutes. Turn the oven temperature to 375 and bake for 30 to 35 minutes longer, until the popovers are a deep golden brown on the outside and airy on the inside. The Chinese Autumn Moon Festival this year falls on September 25. I wanted to share this western version of a moon cake recipe with you now so you would have time to get the ingredients together before the big day. I have not used this recipe before, so I cannot guarantee how it will taste. This recipe replaces the traditional lotus paste filling with raspberry jam. You can buy moon cake molds at The Wok Shop or use a muffin tin: before placing the moon cakes to bake, use a toothpick to poke in a dotted floral design on the top of each individual cake. 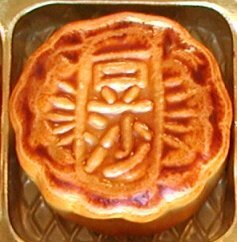 Traditional moon cakes are imprinted with the Chinese symbol for longevity or harmony. Remember to grab a flashlight and head outdoors to enjoy your cakes under the moonlit sky. Preheat oven to 375 degrees. Cream together brown sugar, peanut butter, vanilla extract and butter. Beat in egg. In a separate bowl, stir together flour, baking soda and salt. Add to creamed mixture. Knead dough into a log and place in freezer for 20 minutes. To form a moon cake, roll a piece of dough out on a lightly floured board, creating a 4 inch circle, about 1/2 inch thick. Place 1 teaspoon raspberry jam in the center of the dough circle. Fold in the sides of the dough to completely enclose the filling; press edges to seal. Lightly flour the inside of the moon cake mold. Press the dough circle on the mold and flatten dough into the shape of the mold. Bang the downside end of the mold lightly to dislodge the moon cake. Place moon cakes on an ungreased baking sheet and bake for 15 minutes, or until lightly browned. Cool on wire rack. Enjoy. Boil potatoes (with skin on) until tender, but not crumbly. Peel potatoes when you can hold them and cut into squares or whatever shape you can manage. 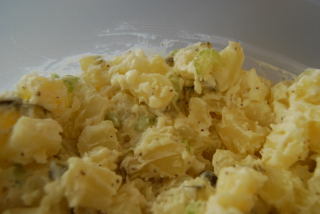 Add the chopped eggs, onion, celery, and dill pickles and mix with mayonnaise add celery seed....a lot of celery seed...even when you think you have put too much in, add some more. Keep adding mayo and celery seed until it tastes good. It used to drive me crazy when recipes were not specific - like how much celery seed, but mom did not measure and it always turned out good. I despise onions, but my husband insists that the onion is necessary for flavor (and he likes them), I add big chunks that I can pick out easily. My mom also said use Hellman's Mayo, but I can't tell the difference between brands, so use what you like. I have a new appreciation for people who photograph food so that it looks good in advertisements. Potato salad is not attractive, and even though I tried "arranging" it for this photo, it still looks like regular old potato salad. 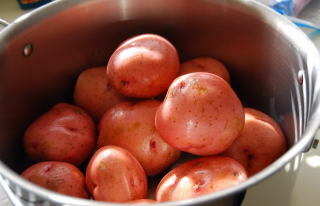 Blogging makes you take pictures of things you normally would not, like a pot of potatoes. Enjoy.